Regina Yoder is an inspiring women’s ministry leader, homeschooling instructor, inventor, and mom of eight. 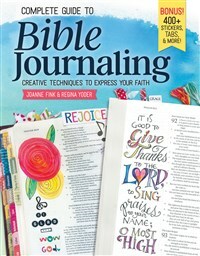 She is passionate about helping women experience a deeper level of intimacy with Christ through the art of Bible journaling. Regina wrote and produced “Clubhouse Kidz,” a Bible memory system, and developed a patented line of creative tools for scrapbooking and Bible journaling. She teaches Bible journaling classes and leads a weekly worship service for women in her community.